This log goes back in time, with newest entries at the top and oldest entries at the bottom.Updated often. Breaking News Click here for more information!The Steamship Historical Society of America will hold it'sFall 2002 Meeting in thePort of New Orleans, LouisianaSeptember 27, 28 & 29, 2002. 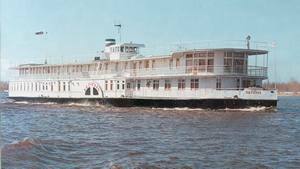 This year's convention will focus on Mississippi riverboats. has filled up! Bon Voyage comrades! This September the SSHSA holding our meeting in New Orleans & the theme for this meeting isSteamboating. The meeting will include a fascinating slideshow & talk by a renowned MississippiRiver steamboat Captain, Doc Hawley, a narrated river tour on the Steamboat Natchez, & a tourof the currently laid up DQSC American Queen, along with a few other local events. The Steamship Historical Society (SSHSA) is an organization dedicated to preserving artifactsand memories from the Steamship days of the past. There are nominal fees for the event, to cover related costs. Contact Steve Swanson of the SSHSAby calling 401-274-0805, Monday - Friday, 10 AM - 4 PM Eastern Time. This year's International Online Steamboat Race took place at the Los Angeles Riveron the Fourth of July. You can view the race by clicking here: see race. The mighty little boats took on the big river with a vengence and all did pretty well, exceptfor the Belle of Louisville model, which ended up in Long Beach Harbor. After the race, the boats traveled by car to Hollywood Boulevard for an awards ceremony,then to a special after-awards party in Hollywood.All are invited to view the race. It will remain a permanent record at this website. Specialthanks to the participants, Jerry Canavit (the winning captain) of Austin, Texas, Carmen Winklerand Franz Neumeier of Munich, Germany, Nori Muster of Steamboats.com, and our Judge, James Wong ofHeritage Workshops in Hong Kong. This past Friday, May 3rd. the Delta Queen Steamboat Co. and the threesteamboats DELTA QUEEN, MISSISSIPPI QUEEN and AMERICAN QUEEN were soldat auction for a reported $80,000,000.00. The winning bidder isDelaware North Corp. with headquarters in Buffalo, NY. The officialannouncement is expected from the U.S.Bankruptcy Court on Monday, May6th. The Steamship Historical Society of America is sponsoring a trip tonorthern Russia for a three-day two-night cruise on the sidewheelsteamer "N.V. Gogol," built in 1911 and one of the last survivingsteamers of her type. The trip also includes a two-night cruise on themotorship "Klavdiya Yelanskaya" to the Solovetsy Islands, a fortifiedmonastery which is a UNESCO "World Heritage Site." There will beseveral days touring St. Petersburg, capital of the Tsars. Dates areAugust 9 to August 21. For further information contactBill Worden. The Steamer N.V. Gogol, an American-style sidewheeler in Russia. Hey, if anyone tried to log on in the last 12 hours, they may have found either a pageannouncing that Apache software had successfully been loaded onto this site (and nothing else)or a page from Surrealist.org with all broken links. This is what happens in the electronicage, when anything can and will go wrong. Our domain host assures us that everything is backin ship-shape and that there should be no further problems. So, if you logged on and gotthese erroneous pages, please just write it off to progress. You were receiving the Apache page because apache was upgraded on the machine your account resides on. You should not receive anymore problems with your account. "The Money section in yesterday's Times-Picayune here in N'awlins said that Waveland Investments LLC,the purchaser of the DQ and MQ, has its eye on the AQ and Columbia Queen as well. Also the Capt MayLight and Cape Cod Light. Looks like the most romantic bits of Delta Queen might all come togetheragain!" The article excerpts he sent are now posted - click here. To all who are interested in old ship's steam engines! A friend of mine has a small shipping line in Kisumu, Kenya, on the shoresof Lake Victoria in Africa. His line runs between towns like Kisumu, Mwanza,Bukoba, Musoma. His two ships are both old and steam-driven, One sunk at the main Kisumujetty many years ago and is in 'unknown state'. The second one, s.s. Nyanza,dates from the twenties and is in working condition. It was converted to afuel tanker a while ago and unfortunately had a major fire onboard recentlywhen off-loading fuel in Mwanza. The superstructure was destroyed but thehull and the steam engines are still OK, in working condition. They arerebuilding the ship now and want to replace the steam engines with dieselengines. The boilers are also taken out of course. The company wants to sellthe engines and the boilers. The ship itself was build in Kisumu, the two steam engines date from whenthe ship was build. Unfortunately there is no name-plate or otheridentifying mark to be found. We think they originate from the UK(Scotland?) and were transported to Kisumu in pieces, first by ship toMombasa and then over the railroad the last 900 km to Kisumu.The engines are triple expansion engines. I attached three pictures. Would there be anyone interested in these two great engines? It seems clearthat it would be a great shame if they were lost. With the Kenyan economybeing what it is, the shipping company of my friend can't help withanything, but they need a good place in a museum in Europe or elsewhere. Me? I'm a Dutchman, also living and working in Kisumu, a mechanical engineerturned IT manager. Hence the involvement in this case.These machines are too nice to be scrapped!! I sent this email to a numberof links I found on the web. If you got this email and don't want to doanything with it, please disregard it. I'm sorry I wasted your bandwidth andtime. On the other hand, I would be grateful if somebody can post this onone of the steam ship oriented mailing lists. Please call or mail me anytimeif you want to know more. 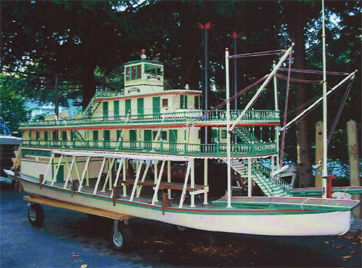 In the first two months of this year, Steamboats.com has acquired two new exhibitsfor our virtual museum. We heartily thank our patrons for their generousdonations. The largest new exhibit is The Dave Thomson Collection, which includesphotos of his home-based steamboat museum, postcards and other historic steamboatphotos. Click here to view the collection. Dave also donatedone of his own works of art to our Surrealist Art Gallery.Click here to seeThe Knight, Death and the Devil, by Dave Thomson. Our other new exhibit comes from Keith Johnson, a photography teacher and collector.He sent in two photos made from antique glass plate negatives depicting the City of Peoriasteamboat. Click here to see these rare items. They ran from New Orleans to Canada carrying freight and passengers.The Michael Edward is a cargo vessel for cotton.The baled cotton was stacked clear to the third deck on the boat.Few passengers were actually carried when cotton was on board.Along the top deck are miniature buckets filled with sand.The round bottom were meant only for sand, never water, becausethe oily cotton, should it catch fire, could only be extinguished with sand.Water would actually cause the fire to spread.The Texas deck, the highest, narrowest deck, was home to the captain and crew.Above that is the wheelhouse.On this boat, a pair of golden antlers on that deck signifies that the boat has won some sort of race.People dressed in period attire grace the decks, including a pair watching the shoreand sipping whisky.The boat had a bar room, but the glamorous image of the riverboat is misleading.The rooms were tiny with just a bed and a hook for a coat.No big salons here. The boats were meant for cargo; people were extra.Boat is located in south central Massachusetts. The University of Minnesota Press has issued handsome editions of two river historysource books: Old Times on the Upper Mississippi, Recollections of a Steamboat Pilotfrom 1854 to 1863, by George Byron Merrick, and A-Rafting on the Mississip' by CharlesEdward Russell. An inscription in the title pages explains that the Fesler-Lampert Minnesota Heritage BookSeries "is published with the generous assistance of the John K. and Elsie Lampert FeslerFund and David R. and Elizabeth P. Fesler. Its mission is to republish significantout-of-print books that contribute to our understanding and appreciation of Minnesota and theUpper Midwest. Old Times on the Upper Mississippi offers a vivid picture of river culture in that area during theyears leading up to the civil war (and two years into the war). The author discusses politics, riverlore, gamblers and gambling, steamboatraces, art and music, and details of the financial side of the steamboatbusiness. A-Rafting on the Mississip' is a book in the same tradition, by Charles Edward Russell. The authorset out to document the culture and collect the stories of the times. All steamboat lovers and lovers of life will enjoy this novel by Charlie Bowen. "Delta Queen"is a love story that plays out on a four day cruise aboardthe romantic old boat, set in the late 1990s. Walker Raines could neverforget his first love, a young Southern Belle named Cherry Boitelle.After thirty years, they meet again on the Delta Queen, whenCherry receives free tickets in ananonymous letter saying that she has won a contest.Walker hopes the "coincidental" reunion will reignite their love. In the course of this incredible story, we learn everything about these two peopleand the history of the Delta Queen, as well as the history the boat has played in their lives. We recommend this book to anyone who is young at heart, who believes in love, andanyone who loves a good page-turner with a satisfying surprise ending. If you've seen the book, I needn't say more. If you have not, you should take alook. It's a hard bound, coffee table-type book that is 128 pages of photoessay on the six existing steam-powered paddlewheelers operating on theMississippi River System. The text is brief - but the photography isabsolutely first rate. Kral is a shooter of the first order. It's amagnificent presentation. With the possible exception of David Plowden'sphoto essay on steam, it's the best visual book on the subject I've comeacross. It contains some shots of the DQ that are breathtaking.